The specific reasons for choosing servo-press technology are as varied as the specific advantages that the technology offers. Increased capabilities and productivity in stamping advanced high-strength steels for automotive; a new servo unit that works as a hydraulic press in beast mode to take on traditionally hydraulic-press applications, as well as whatever new business may come through the doors; the ability to expand design possibilities due to a servo press’s dwell capabilities; increased die life with reduced costs for press maintenance and energy usage; the ability to efficiently and precisely stamp aluminum automotive parts... the list goes on and on. At the end of the day, what a servo press delivers can be described with a single word: flexibility. In one press, metalformers can take on work once considered solely for a traditional mechanical or hydraulic press. A servo press will work with materials of any strength, shaping them with features previously only accomplished via secondary processes. In this age of custom manufacturing, with smaller runs and more numerous part types, flexibility is necessary. Over the following pages, read how metalformers are making the flexibility of servo-driven presses work for them. Maybe you will find new ways in which the technology will work for you. Large, big-bed, high-tonnage-capacity presses star at the E&E Manufacturing of TN LLC facility in Athens, TN, opened in 2005 as an adjunct to the firm’s parent facility in Plymouth, MI. While the Michigan plant focuses primarily on production of seating and suspension components and assemblies, as well as supplying stamped fasteners and parts for military vehicles, the Tennessee facility fulfills a completely different mission. In July of this year, E&E added a second big-bed Schuler transfer press, this one a 2000-metric-ton beast with 7300 by 2500-mm bed. Among its selling points is the tailout feature on the press’s feed line, which can eliminate 10 to 20 ft. of material waste per coil. Aligning its pressroom capabilities with the requirements of its OEM customers led E&E, in 2014, to turn to servo-press technology, with the addition of a Schuler 1650-metric-ton servo-transfer press supplied as a complete turnkey system with an integrated servo-driven shear and coil-feed line. What Work Landed on E&E’s New Servo Press? Michael Hylton displays recent stamped parts coming off of Thai Summit’s new 1200-ton Simpac servo-transfer press: rear-wheel-opening reinforcements stamped from 0.9-mm-thick 6000-series aluminum sheet. The press, identical to another Simpac servo press installed in 2014, features an 800-mm max and 200-mm adjustable slide length. Its transfer system offers 1524-mm max. feed stroke, 400-mm clamp stroke and 200-mm lift stroke. With its new-found ability to take on even larger and more complex parts, due to the ability of the larger bed to handle dies with more press stations, E&E already has earmarked 28 die sets for the new press, for Mercedes and BMW programs. 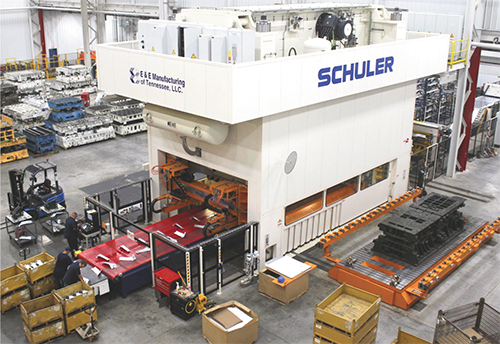 To help engineers find opportunities to optimize the stamping process, E&E employs a Schuler software tool called Transfer Pro, which it supplies as an add-on with its servo presses. F rom the corner office to the shop floor, you can reap big benefits by attending the Servo Technology Experience, powered by MetalForming magazine and the Precision Metalforming Association. The two-day technical conference, October 3-5 in Cleveland, OH, covers state-of-the-art servo technology used in presses, transfer systems, coil-feed lines and more. The Servo Technology Experience will provide technical presentations and case studies describing how modern servo-based equipment can help stampers improve productivity and quality. Day one of the conference will focus on servo-press technology, and include scheduled breakout sessions with leading press suppliers. Here, attendees will have the opportunity to network with industry thought leaders and gain unique insights into how this technology is leading the evolution in the metal-stamping industry, and where the technology is headed. Day two of the conference turns attention to transfer systems, coil-feed lines and other servo-based technology prevalent in pressrooms. Attendees will learn how these systems work in unison to lead stampers to increased performance and profitability. To register or for more information, visit www.metalformingmagazine.com/servo. In addition to appreciating the ability to gain additional strokes/min., Scherle also boasts of the presses’ ability to avoid splits when forming difficult AHSS parts. Within in the last few years, two huge servo-transfer presses have joined the ranks at the Thai Summit America’s 1-million-plus-square-ft. stamping and assembly facility in Howell, MI. The big-bed (7300 by 2300-mm bolster) 1200-ton presses, both Simpac models, joined, in 2014 and 2015, respectively, two other servo presses previously installed at the facility. They allow the firm to take on an increasing amount of aluminum stamping for the Ford F150 program; it also supplies the Ford F250 and F350, and the Ford Escape programs. Thai Summit America, which in 2009 took over the facility previously operated by Ogihara, stamps parts as small as 4 by 4 in. to as large as 13 by 7 ft., using transfer presses and tandem lines with press capacity to 2700 tons. The company, known for its deep-draw expertise, has vast experience stamping high-strength steels and tailor-welded blanks, although aluminum projects for the F150 now account for half of its output. Two servo presses (800 and 1200 tons) were first on the scene, joining in 2013 the firm’s existing transfer presses, tandem lines and tryout presses, along with assembly bays. 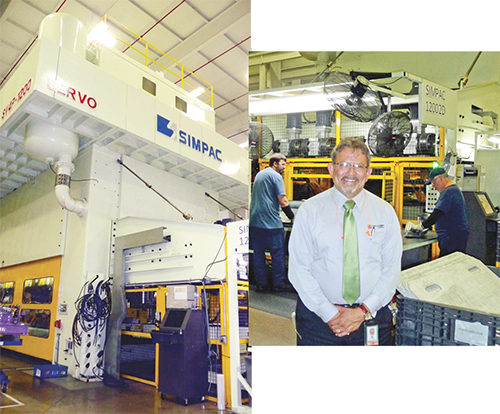 Then, in 2014 Thai Summit brought in the first of its two Simpac transfer presses, the first equipped with a Feed Lease servo-feed line “engineered to handle aluminum coil stock and to prevent marking or buildup on the rolls,” says Hylton. Also included were Wayne Trail servo-transfer systems that feature a half-pitch cycle option. 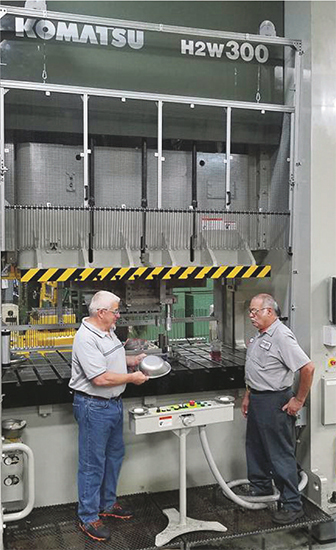 Manor Tool and Manufacturing Co. production supervisor Carlos Ruvalcaba and toolroom manager Dan Kiraly review a successful deep-draw project completed recently on the firm’s new 330-ton servo-mechanical press. The second transfer press, added in 2015, features a coil line and transfer system completely integrated by Simpac. “From a purchasing standpoint,” says Hylton, “the presses perform as expected. Our team appreciates the ability to control the ram speed anywhere in the cycle to help with forming, and we can run progressive dies in the pendulum mode and maximize the stroke rate. We can run prog. dies at 40-plus strokes/min., and transfer dies at speeds to 32 strokes/min. Where we need precise control of ram speed in difficult forming applications, we can slow the stroke rate to, for example, 12 strokes/min. at the bottom of the stroke, then then run the rest of the press cycle at 30 or more strokes/min., to maintain a good, fast average pace. The presses run some 60 different parts for the F150 program from a handful of dies, from 0.7- to 3.5-mm-thick aluminum in the 5000- and 6000-series grades. “Our dies are designed and optimized to run in the servo presses,” adds Hylton. “Using AutoForm to run forming-process simulation, we can optimize the stamping process using the unique capabilities of the servo presses to help us overcome issues with thinning and fracturing, etc. And, where simulations don’t identify forming issues, we can be less selective about which press we employ for a given job. 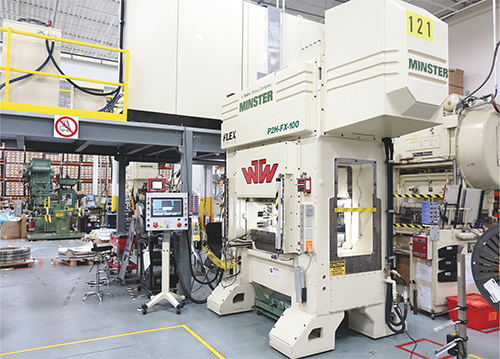 A new 100-ton servo press at Wiegel Tool Works (WTW) satisfies the company’s need for speed while offering endless advantages versus a standard mechanical press, including increased drawing capabilities, according to Ryan Wiegel, WTW vice president. Thai Summit America continues to expand, and will soon launch production of aluminum stampings and assemblies for the 2018 Ford Expedition/Navigator program, as well as for the Tesla Model 3. Manor Tool, which operates two facilities in Illinois—a stamping and sheetmetal-fabrication shop in Schiller Park, and a die shop in Addison—eyes at least two specific applications for its newest press: coining and deep drawing. Added to the company’s 30-press stable in September of 2016, the press promises to fuel management’s desire to add flexibility to its operations, and attract new business. The management team at Manor Tool and Manufacturing focuses on building a diversified portfolio of capabilities, processing a range of parts and materials including 0.005-in. phosphor bronze as well as 3⁄16-in.-thick quarter-hard stainless steels, aluminum-alloy sheet, as well as plate to 3⁄8 in. thick. Its customer base includes OEMs in the aftermarket-automotive, heavy-construction and metal-furniture markets. In addition, the firm actively seeks R&D opportunities to improve every facet of its operation. Two recent such cases (in addition to adopting servo-press technology): development of new tool coatings and of low-cost dies. Another more immediate project completed at the company: adding, in August of 2017, a Coe SpaceMaster servo-based compact coil-feed line to its new Komatsu press, to create a complete servo-based system. The line handles coil stock to 40 in. wide by 18 in. thick (1⁄4-in. stock at a 10-in. coil width). “Deep-draw and coining applications account for some 45 percent of our work,” says Simeone, “and we expect continued growth in those two areas. The coil-fed servo-press line will support that growth. Wiegel Tool Works, Inc. (WTW), Wood Dale, IL, specializes in precision metal stampings for several markets including aerospace, automotive, electronics, telecom and more. As a contract manufacturer, the company sees jobs with part quantities by the thousands to millions per year and with numerous geometries; thus the need for flexibility and the reason why the company has been on the lookout for a servo press since the 1990s. Even then, servo technology displayed capabilities beyond the traditional mechanical presses of the day, and has only improved over the years since. Finally, in November 2015, WTW took the plunge and purchased its first servo press, a P2H-FX-100 from Nidec Minster. In production since 2016, the 100-ton press has performed exceptionally well on numerous jobs even though, as Ryan Wiegel, WTW vice president, admits, the company has only scratched the surface of what a servo-driven press can do. Where the machine has earned its keep thus far, according to Wiegel, is speed. Wiegel also notes the liquid-cooled servo motors that enable increased production speed, which he sees as an advantage over fan cooling. Liquid-cooling servo-motor technology consistently provides more usable power than comparable air-cooled motors, according to Nidec Minster officials, in addition to maintaining thermal stability and cooler operating temperatures. These attributes also result in increased press-component life. Other features of Wiegel’s new servo press include a low-inertia drive engineered to enable higher acceleration and deceleration rates. Lower torque requirements also result in higher-efficiency forming, according to Nidec Minster officials. In addition, the eccentric-shaft design reportedly creates improved dynamic parallelism and bottom-dead-center accuracy, and minimizes backlash for consistent accuracy in pendulum mode. Beyond that, beefed-up construction allows the press to withstand the force generated when stamping the latest high-tensile-strength materials, and an operator-friendly HMI provides the ability to quickly choose from highly customizable slide-motion profiles. But again, it is the speed that has most impressed Wiegel and WTW.